This is the first in our three part series on winching, with this part dealing with how to choose a winch for your Land Rover. Winches are useful additions to get you out of the most sticky of situations. If you're thinking you want to add a winch to your Land Rover, there are a few questions you first need to ask yourself. This may seem fairly obvjous but different tasks require different winches. Is it for off road competition, trips to the woods for hunting or just the occasional light use on track or field? This will partially dictate the winch you buy. In competition you need a fast winch and will want to add extra batteries and a bigger alternator to charge the batteries faster and let your winch work for a longer time before you have to stop winching and let the batteries recharge. For general use where speed is not as important and you don't want to go to all the expense of up-rating your electrics, a slightly smaller winch will do with just a higher amperage battery. And if it is only likely to be used really on light easy pulls, you can use a standard battery. This calculation is relatively easy - get the gross weight of your vehicle - that is, the weight fully loaded, because when you get stuck it's not going to be a empty vehicle. It's going to have all sorts of people, dogs and equipment on board. If you are going to enter off-road competitions you need to double your gross weight to give you the size winch you need. If it's general use then 1.5 times the gross weight will do. 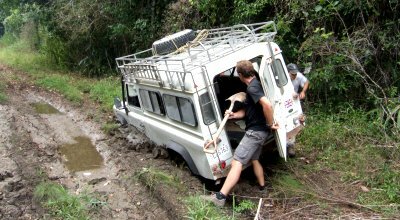 You need to multiply the gross weight because when you get stuck you won't just be pulling the vehicle, but all the mud and muck you are stuck in as well. Don't be persuaded to put on a bigger winch than you need for the job, as you will be using up precious battery life faster than you need to. Also don't try and save money by buying too small a winch and burning out the motor. For example, a Land Rover Discovery weighs about 1.75 tonnes but the gross weight is 2.5 tonnes. Multiply this by 1.5 and you get 3.75 tonnes = a 8,500lbs (3,860kg) winch and for competition the slightly bigger 9,500lbs (4,300kg) winch is ideal. The gross weight of a competition vehicle should be less than its maximum weight as you will have taken out any excess weight. If you have a fully equipped expedition 110 Land Rover weighing nearer 3 tonnes you would go up to a 12,000lbs (5,442kg) winch. These are not hard and fast rules but a good general guide. Hydraulic winches are mainly used on commercial recovery trucks where they are in constant use. There is one for leisure use, the American Milemarker. This takes its power from your power steering pump. They will pull all day long but they are SLOW, very SLOW, as a power steering pump is high pressure and low volume. I do use a hydraulic winch on my Lightweight but it is highly modified with a separate pump, bigger motor and pipework to give it the speed you need in extreme competitions such as the Ladoga Trophy. With electric winches, the main thing to look for here is what amperage does the motor draw? No alternator is going to put power back in to the battery as fast as the winch is going to draw it out, so the fewer amps the winch uses, the longer your battery will last before you have to stop and charge it up. Also a major thing to look for is how well waterproofed it is. As everyone knows, electrics and water don't mix! We have a 9.5 mounted on our Discovery as a demonstrator and will be happy to give any one who wants a demonstration as we are confident in the build quality of our winches. They have been designed for maximum water resistance and the powerful series wound motor draws less amps than most other winches. These winches will match up to anything on the market, just check the manufacturers' specifications.